It’s only natural that Cravath‘s unsurpassed excellence in corporate and litigation work would extend to situations in which the firm’s clients or their competitors found themselves in difficult financial straits. 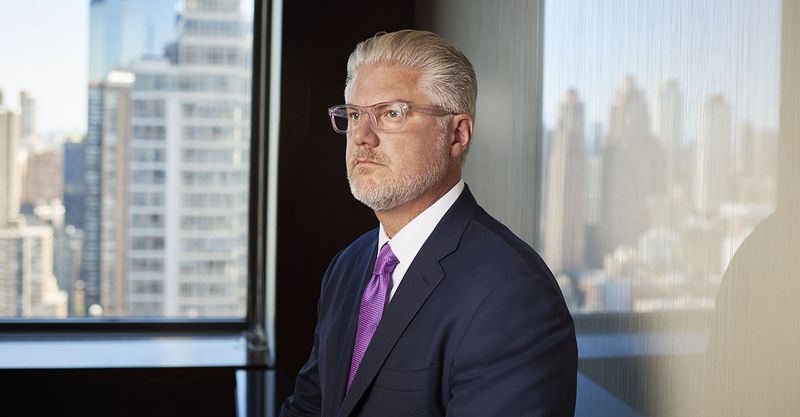 That element of Cravath’s holistic counseling is guided by Paul Zumbro, head of the Financial Restructuring and Reorganization Practice and a true master of distressed financings and M&A bankruptcy transactions. Zumbro enjoys the blend of dealmaking and litigation required to navigate the terrain that he describes as “M&A flipped on its head” – maximizing value in difficult situations. Lawdragon: Please discuss how you came to develop a practice focused on restructurings and reorganizations. Did this begin at Columbia Law or once you arrived at Cravath? Paul Zumbro: Definitely after I arrived at Cravath. At Columbia Law, I knew I was interested in corporate law, but the focus on restructurings and reorganizations came through the deal and litigation experience I gained at Cravath. Relatively early in my career I worked on a transaction that, while I didn’t recognize it as such at the time, was a distressed M&A transaction. Our client was on the brink of bankruptcy and was very much a “motivated” seller, and there was a very aggressive law firm on the other side of the deal. Though our client wasn’t necessarily in a position to negotiate on terms, it was an interesting challenge to find pockets of leverage within the deal negotiations. When I became a partner in 2005, my practice was focused primarily on leveraged acquisition financing transactions. Even then, I found it most rewarding to navigate the challenges that arose when a deal ran into trouble and needed to be restructured. I’ll never forget the call I got from a banker client informing me that Tropicana Entertainment, an LBO I had worked on for the client, had lost its gaming license in New Jersey, resulting in the company losing 50%-plus of its EBITDA (earnings before interest, tax, depreciation and amortization). Not surprisingly, that led to a bankruptcy filing and the first section 363 auction and sale process I worked on in my career. When the financial crisis hit a few years later, several large financing transactions that I had worked on at Cravath ended up in litigation or facing threats of litigation, and I became the liaison between the corporate department and the litigation department as we defended our bank clients in several high-profile disputes. I enjoyed it immensely, and that was what got me interested in focusing on restructuring work with its blend of deal making and litigation. LD: Can you discuss more what you like about this type of practice? PZ: This hybrid nature of the work – and the fact that restructuring and insolvency touches all aspects of corporate law – is what I like best about the restructuring practice. The multilateral nature of negotiations in the restructuring space – working with multiple parties, each with varying agendas and goals – makes the successful completion of those matters all the more rewarding. Bankruptcy is also an area that tends to make people somewhat uneasy – the fear of the unknown – and so effective counseling is at a premium and there is a rewarding sense of partnership between counselor and client. Whether there is a corporate client looking to ring fence liabilities relating to a troubled business segment or worried about its relationships with a distressed commercial counterparty, or an executive client concerned about properly structuring a personal loan or the implications of a bankruptcy filing on an employment contract, a skilled restructuring advisor can add real value. LD: How does the firm’s associate rotation system work for the practice? PZ: Cravath’s unique training system is one of the keys to the firm’s long-standing success, and the restructuring practice fits right into that tried-and-true model. Associates rotate between corporate practice areas, focusing not just on bankruptcy, but also other types of corporate transactional work. The restructuring practice also draws associate resources from the litigation department, where the firm has a number of active bankruptcy litigation matters and a deep pool of bankruptcy litigation experience. Teaching our associates about bankruptcy work, not only as a stand-alone subject, but also in relation to other corporate and litigation areas, is the unique aspect of being a restructuring lawyer at Cravath. The breadth of experience our associates amass by working through Cravath’s rotation system is an enormous benefit – especially when many restructuring practitioners have a rather narrow focus. Cravath lawyers know the basic rules, but more importantly can provide strategic guidance in the field of restructuring that draws on this breadth of experience. More generally, seeing what happens in the real world when things go wrong is an invaluable tool no matter what area an associate ends up specializing in later in her or his career. I vividly remember one of our senior M&A partners making the observation during the financial crisis that it is the “stuff at the back of the document” that really becomes critical when things go wrong, and a rotation through the restructuring practice gives our associates the ability to see this first hand. LD: What is the importance of a bankruptcy and distressed finance practice in a world-class law firm like Cravath? PZ: Cravath’s commitment to serving its clients has been a hallmark of the firm since its founding, and having top-notch capabilities in the restructuring space allows us to continue that level of service when a client finds itself, or one of its counterparties, in distress. When one of our regular M&A clients is interested in acquiring a competitor that has filed for bankruptcy, our world-class M&A team partners with our restructuring group to get the deal done. Our premier syndicated lending and debt and equity capital markets practices also feed into the restructuring practice, in the form of in- or out-of-court loan workout transactions and debt exchange and other liability management transactions. The experts at https://aaacreditguide.com/ explain how things like debtor-in-possession and exit financings are generally handled by the restructuring group, but similarly we draw on expertise from the financing practice. Our litigation department works on complex claims and derivatives litigation in the bankruptcy court, and also handles bespoke restructuring litigation work like our work on the Argentina case. LD: Can you talk a bit more about the firm’s work on the Argentina case, in which the firm structured a settlement with bondholders to bring the country back to the capital markets? How was the firm able to achieve a great result for the client so quickly, after many years of the situation dragging on? PZ: The Argentina litigation settlement and restructuring were immensely complicated and there was a great deal of history in the case before we got involved. We needed to get up to speed on the situation quickly in order to help the new Argentine administration achieve its goal of putting the “holdout” litigation behind the Republic. Given the great deal of bad blood between parties, we also needed to be mindful of the history of the situation, but not let that history get in the way of accomplishing the new administration’s goals. Our litigators did a masterful job in gaining the confidence of the court and setting up the situation procedurally so that the injunction that had been imposed on Argentina for so long was lifted. This allowed Argentina to return to the global capital markets for the first time in 15 years. On the restructuring side, we focused on making sure that the agreement in principle to settle the dispute was successfully implemented. The devil is always in the details, but the level of distrust that had developed between the parties over the course of many years of acrimonious litigation required a heightened degree of detailed negotiations relating to things that, in another context, might have been thought of as mechanical, such as procedures governing the funding of the settlement payments. Because the deal was at risk of falling apart at any time, it was critical to ensure that the bond issuance proceeds and settlement payments could go forward without risk of attachment or other problems. As this matter demonstrated, a deal can come together quickly – the initial agreement in principle to settle the litigation was handwritten on a single piece of paper – but actually getting the deal done requires lawyers that are commercial and pragmatic and able to navigate waters that at times can be extremely choppy. Achieving this successful result for Argentina in a very short period of time required close coordination between Cravath’s litigation and restructuring teams. This coordination is crucial to foster, because I believe our clients get meaningfully better results when litigators are actively involved in the restructuring process from the outset – as opposed to just stepping in for specific courtroom tasks. LD: Are you seeing any patterns in your practice with the types of matters occupying your time that comment on any broader economic trends? PZ: The oil and gas industry seems to have largely completed its most recent bankruptcy and recovery cycle, and we are seeing more “exit” financings than debtor-in-possession (bankruptcy) financings in that sector these days. Retail continues to be a challenged sector, and the “Amazon effect” and other challenges in the retail sector will inevitably spill over to other sectors, such as mall owners and REITs and other commercial real estate businesses. One thing I’ve found interesting in the retail space is that the challenges cut across the entire sector, from low-end retailers to those on the very high end. Of course this type of distress can bring about opportunities. One of our clients in the retail space engaged in an M&A process a year or so ago with one of its competitors. That deal didn’t end up happening, but when the competitor filed for bankruptcy, our client was able to go in and purchase the stores it wanted in a bankruptcy section 363 process. It’s that seamless transition of capabilities – where Cravath moves from a straightforward M&A team to a bankruptcy M&A team – that allows us to really deliver the best of the firm to all of our clients, no matter what the situation. Thinking ahead, while it’s always difficult to predict the future, determining what the actual “Trump effect” will be on the U.S. economy seems particularly difficult to predict. On the one hand, if the Fed allows interest rates to rise, that would tend to increase restructuring activity as overleveraged businesses will be forced to deal with an increased interest burden. On the other hand, deregulation tends to reduce costs on businesses, which would point in the opposite direction. It’s really too early to tell, but deregulation can have a significant impact on the restructuring cycle in certain industries – think airlines and the serial bankruptcies in that space following deregulation. Rightly or wrongly, business sentiment seems positive at the moment, but given the uncertain geopolitical environment, that could change quickly. LD: What are some of the issues that arise in global bankruptcy cases, and how did you learn to navigate those complexities? PZ: Global bankruptcy cases often give rise to complicated jurisdictional and choice of law issues, and the need for careful coordination and preparation. A U.S. lawyer tends to think in terms of Chapter 11 and how restructurings are affected under that framework, but it is certainly not the case that all jurisdictions have statutory regimes that encourage or even permit reorganization. Certain jurisdictions may not have a statute or any procedures relating to insolvency at all, though that is atypical. In many other jurisdictions, the debtor’s management is replaced by an administrator and the assets are liquidated. This is what restructuring is all about – maximizing value. I think of it as regular-way M&A flipped on its head – whereas non-bankruptcy M&A is about bringing assets together in the hopes of increasing value on a prospective basis, restructuring is about salvaging the most value possible where things have not worked out as expected. The same set of skills, plus a lot of specialized bankruptcy knowledge, is necessary to effectively accomplish that goal, whether in a purely domestic context or in a global deal. And lastly, because insolvency laws are very jurisdiction specific, it is also important to know, and to know how to effectively work with, restructuring counsel in the specific jurisdictions involved in a particular matter. At Cravath, we practice New York and U.S. federal law, but we maintain a robust network of “best friend” firms internationally, allowing us to bring best-in-class talent to cases around the world. LD: Do you foresee the bankruptcy and distressed asset practice growing in the next few years? PZ: I do expect the restructuring practice will grow over the next few years, though that is not necessarily reflective of a market prediction. Cravath has historically done a great deal of restructuring work – going back even to the days of Paul Cravath, who was one of the leading restructuring lawyers of his day – and we have continued to focus on building out our restructuring capabilities in a manner that is integrated with and supported by the firm’s preeminent litigation, capital markets, syndicated lending, mergers and acquisitions and tax groups. I believe our focus on extending those market-leading practices will allow us to serve our clients’ needs in a way that is holistic across all corporate practice areas – a benefit no matter what the state of the market may be.